From life-saving surgeries to elective procedures, there is a lot riding on the outcomes in these spaces. Patients, surgeons, staff, and health-care facilities all rely on the care being provided in these surgical spaces. But, how do you ensure that surgeons are able to do their best work in the operating room? You equip them with modern solutions that provide the most information, the clearest details, and the highest level of accuracy. Before looking at specific technologies, decide what capabilities you need. Specialized surgical suites will require different technologies than general operating rooms. Display of images, video, data. Information and media should be clearly displayed on FDA-approved, medical-grade monitors. Recording, streaming, and broadcasting. If you will need to broadcast or share the procedure—either live or on-demand—you want the ability to record, stream, and broadcast. When necessary, physicians may want the ability to review and someone annotate while in the surgical suite. Data and content management, archiving, and security. You’ll want to make sure you have the ability to securely store data and recordings as long as necessary. Integration with other technology. Consider what other kinds of technology you'll need to interoperate. Control of all technology. Ensure you can control all the audiovisual equipment—lighting, cameras—from one device for more efficient and precise command of the room. 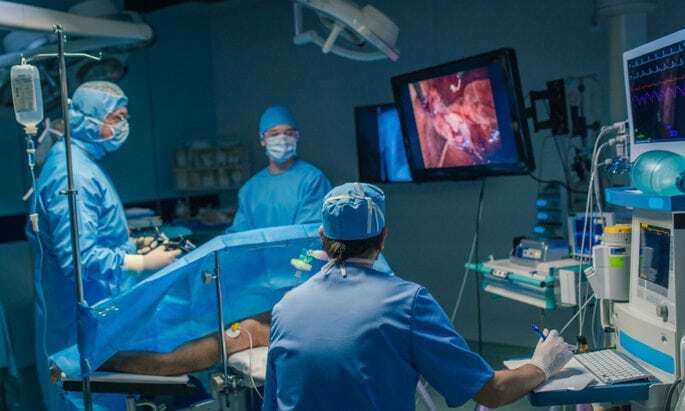 Once you know which capabilities you need in your surgical suite, you can look at specific solutions, including mics, displays, software, imaging cameras, IP video, and more. Some all-in-one solutions have been designed just for operating and surgical rooms. These are the basic solutions, but there are other digital devices and applications for specialized use like digital instruments and automated dispensers. Also, an increasing number of modern facilities are looking at robotics, virtual imagery, and augmented reality. Other considerations include how much use the room gets, whether the solutions are scalable, how the solutions fit into the space, and whether you have the support capabilities to maintain and monitor the equipment.